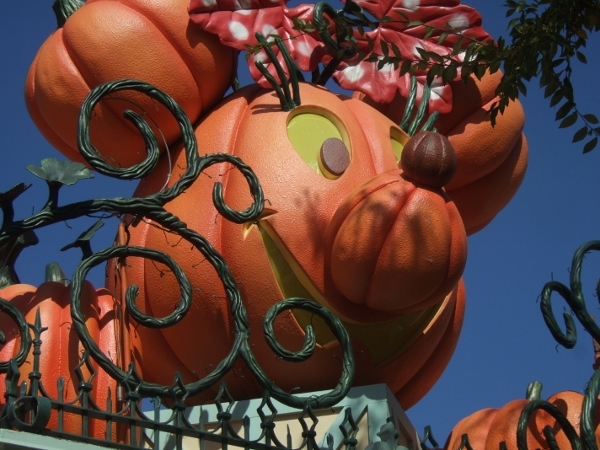 Not only does Halloween Time at the Disneyland Resort brings possibly the best displays of theme park decor that Disney has to offer; it also brings Disneyland’s only annual hard-ticketed event – Mickey’s Halloween Party! 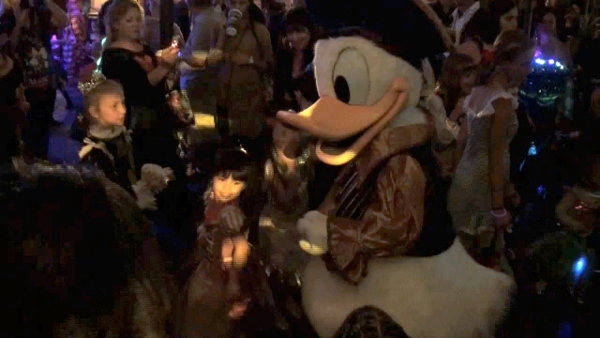 As we have done in the past, the Disneyland Team decided to attend the first party of 2011 and share a glimpse of what we experienced. I’ll also be including a video of the event highlights, some of our best tips, and a link to the special podcast we did reviewing the experience. While the party doesn’t start until 7:00 pm, you’ll find the majority of party guests descending on the parks and parking structure around dinnertime. This fact presents some challenges that even experienced Disneyland guests face. Therefore, before getting into the party information, it has to be said that this is a difficult time frame to get food in the parks. Keep in mind that your tickets allow you to enter the park at 4:00 pm, so it may be worth it to take advantage of this. DINING TIP: EAT BEFORE YOU COME or eat early! Many of the in-park, Disneyland dining establishments are either closed or converting to party zones during the dinner hour, so make sure you find out your dining options if you are expecting to get food upon arrival. The Downtown Disney restaurants may be your best choice for a pre-party meal. No matter what time you arrive at the Mickey and Friends Parking Structure, you’ll get your first sighting of Halloween as the tram departs to the park esplanade. PARKING TIP: The Mickey and Friends Structure has a tendency to encounter long lines, slow feeds to the levels, and congestion at the tram boarding. Wayne suggests that you can avoid this by using the oft-forgotten Toy Story Parking Lot off Harbor Blvd. Touring buses will take you quickly to the parks, shaving off long wait times. One you pass through the security gates, the decorations continue in the esplanade. The Fab 5 pumpkins are out again above the turnstiles into the park. Granted this photo was taken before dark, but the nighttime effects on them are truly fabulous. They flicker and glow, like the true pumpkins they represent! TOURING TIP: By entering the park early, you can get a chance to see the full extent of the park’s Halloween decorations in the daylight, as the sun goes down not long after 6:00 pm. There are so many details that you just don’t want to miss. Party-goers have two options when it comes to entering the park and checking in. If you are entering the gates using your party ticket, you will immediately stop and visit a cast member at one of the many tables lining the entry courtyard. You will show them your tickets and they will give you your wristband, as that is how cast members will know that you are allowed to stay in the park for the event. If you are already in the park with Annual Pass or General Park Admission, you will head over to Carnation Gardens, where these same tables are ready for you to check in and get your wristband. HAPPINESS TIP: It is important to keep the band on your arm and visible. All other guests are systematically swept out of the park by cast members “blocking off” or restricting areas of the park, from the back, toward the gates. This was done politely and efficiently. Of course, even though there are signs telling guests that the park will be closing, there are always a few that either just don’t understand or didn’t figure it out. Therefore, as you pass the “sweepers”, be polite and make their job easier – don’t make them ask to see your wrist band – just hold up your arm for them to see it! 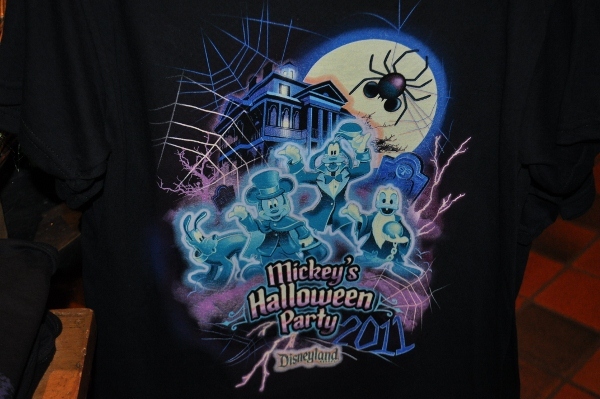 When you hit the turnstiles, you should have picked up a special Mickey’s Halloween Party map. We’ve scanned it in, to give you a little preview of what to expect. To see it in a larger size, click here. This map will be your guide to Trick or Treat Zones, open food locations, shops featuring special Halloween merchandise or treats, and events like the dance parties. PLANNING TIP: One of the things we discovered was that not everything is listed on the map, so if you just follow it, you will miss out on some fun character Meet and Greets and Trick or Treat locations. Promotional plastic Trick or Treat bags will be given to you after getting your wristband. Warning: they are small and you WILL overfill them. PLANNING/HAPPINESS TIP: Bring your own Trick or Treat sack. It will be bigger and you will be glad you had someplace else to stash that jacket/pirate hat/tiara that the kids won’t keep on. One thing to keep in mind is that the hub is truly the epicenter of this party. You can’t help but be lured to the castle during your trip down Main Street U.S.A.. Its innocence seems to blur in the eerie clouds that the fill the sky just after dusk. 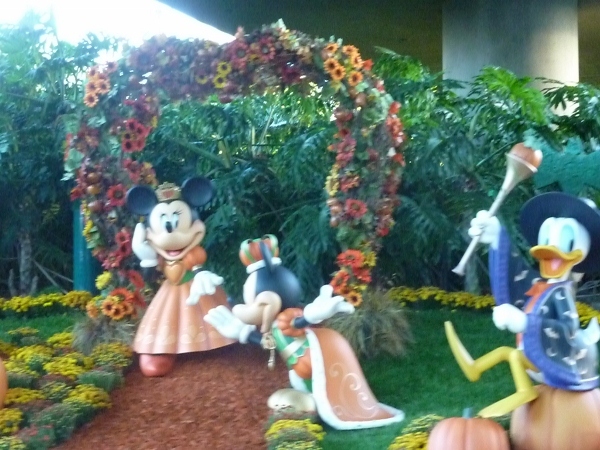 Of course, the colored lighting and those glowing Mickey pumpkins help to transition the mood. 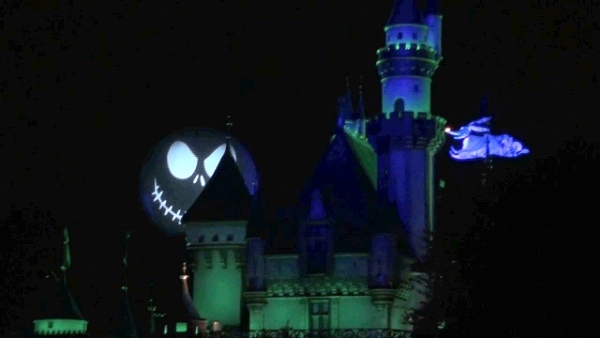 As you move around the park, you see the projections that give the party an even-more spectacular flair. 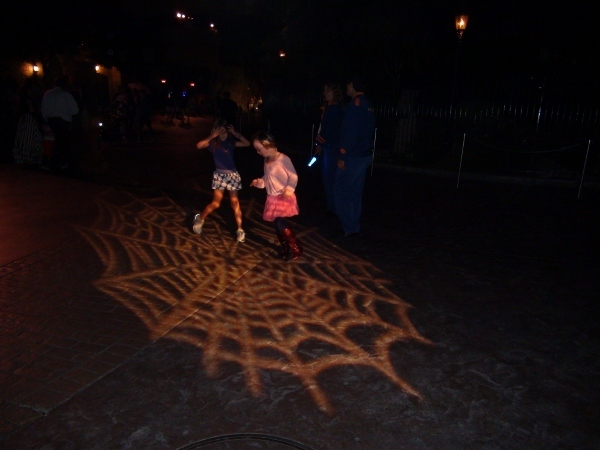 The castle crawls with spiders and ghosts, the streets are filled with dancing webs and other delights. HAPPINESS TIP: Make sure you spend a few minutes letting your family enjoy these special atmosphere moments together, while everyone else rushes from here to there. 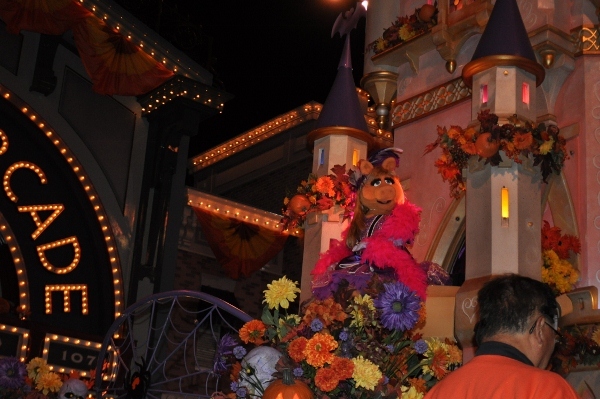 As you wander around the park, you become amazed at the way the atmosphere has changed to reflect the Halloween theme. For instance, the S.S. Columbia – an American Sailing Ship, has been transformed into a ghostly pirate vessel and the Rivers of America are now as eerie as the River Styx. Speaking of rushing, it’s worth mentioning that folks attend these parties one of two ways – with a plan and without. Out team decided to divide in two. We decided we would treat the event as a normal, non-uber Disney family would – and we split up. Tom’s and Tony’s families decided to take the traditional focus on eating first, rides next, then fireworks, and finishing with the cavalcade and more rides. Trick or Treating would be intermixed or after, but not a priority. They were all seasoned Halloween Party guests, with older boys, so the “fun factor” drove their choices. Since Wayne, Mary Jo, and my family ate on the way down to the park, we skipped the food priority and chose some basic goals, with no specific plan. On our list were: at least one dance party, the early (8:30) run of Mickey’s Costume Party cavalcade (mini-parade), and the fireworks. We put no focus on rides, since this was really our girls’ first time experiencing this event. We took them to the Walt Disney World’s Mickey’s Not-So-Scary Halloween Party when they were 2 and 9 months old, respectively – not the age of remembering such things. I’m going to be right upfront here. While Tom and Tony discovered quickly that food was not easy to find and that they should have looked at the map before starting out, we discovered something else. HAPPINESS TIP: You will never be able to squash your children’s desires to eat treats from their bag. Unless they have a specific reason for not downing a major dose of sugar, it really is okay to just give in for one night. I had to learn that lesson the hard way. No matter how hard we tried, we couldn’t keep the girls from rushing to the first Trick or Treat trail they found. Ours was in Pixie Hollow – of course, upon hearing that, the boys were thrilled we had split up. HAPPINESS TIP: Make sure you also ask for one or two of the healthy items, as you go through the Trick or Treat Trails. Cast members are more than happy to add those treats in bags, on top of the candy they already gave you. That way, you have apples (both fresh and freeze-dried), raisins, carrots, or fruit snacks to feed them in a one-to-one ratio with the inevitable stream of candy that I mentioned earlier! The most important thing about Trick or Treat Trail quality is obvious. I can say that candy lovers will not be disappointed. 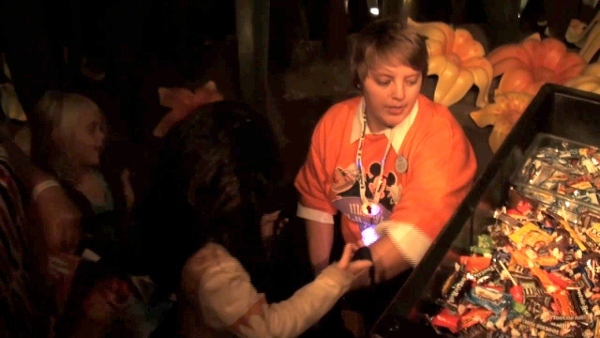 Cast members passed out handfuls of chocolate treats, such as KitKats, Twix, Nestlé Crunch, Reeses, and Tootsie products. Other items included, Skittle, Jots, and the healthy snacks I mentioned in a previous tip. There were two issues with this year’s trails. 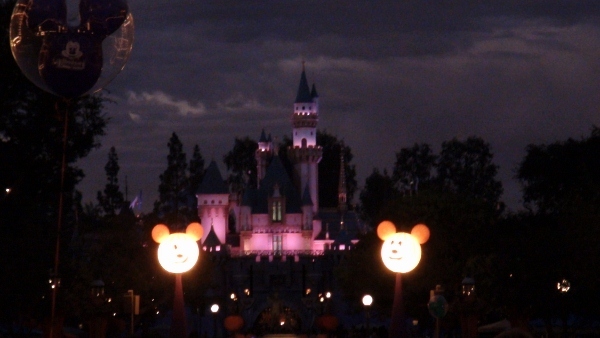 In 2010, the trails were easily visible with large Mickey Ghosts at the start of each one. This year, they were not as distinct. In fact, there were locations that were not even marked on the map. Additional trails were found in the Pirates of the Caribbean queue, Splash Mountain queue, Pinocchio’s Village Haus, and other locations. There were often long lines in the congested areas of the park, such as Tomorrowland, due to the fact that the treat stations were scattered and not necessarily in queue or trail form – especially the one by Star Traders. There were no squares of Ghiradelli chocolate to be found. Ghiradelli has long been a partner in this event and there was always 1 station that had these nuggets of yummy goodness. Yeah. That’s gone. PLANNING TIP: If you want to make the most of your time, avoid the stations with the longest lines. We also found that some of the queues – especially the one at Splash Mountain – were deceiving. It looks as if there is only one station, but if you go farther down the path, you’ll be rewarded. Most attractions are open during the party. Since our Halloween Party date was sold out, it was no surprise to find 60 minute waits on the most popular attractions – Space Mountain Ghost Galaxy, Star Tours, and Haunted Mansion Holiday. Attractions like Astro-Orbitor and Buzz Lightyear AstroBlasters were around 20-30 minutes. Since it’s usually mid-60′s weather during the parties, Splash Mountain, Big Thunder, and the Matterhorn, however, were a walk-on, as well as most of the dark rides. DINING TIP: If you are heading into a long queue, such as Haunted Mansion Holiday, make the most of your time by stopping at your favorite counter service location and bring a snack to the queue. There are always trash cans in the queues, so you can grab a quick nosh and revive yourself. My favorite food items for this tip are the skewers from Bengal BBQ, in Adventureland. You can easily eat 2 of them in a 30 minute queue! Our breakdown: Tony’s family rode about 3-5 rides between 7:00 pm and 11:00 pm, Tom and Tony did 2, Wayne did 3, my family did 1 and I did none. We all watched the fireworks and the team hit the cavalcades, while Tony’s family opted out of the cavalcade, so they could get in their extra rides. PLANNING TIP: Set reasonable expectations on how much you will actually see and plan your experiences based on your family’s personal priority. If you want to make the most out of the special party offerings, you definitely won’t be able to do and see everything. This is especially true if you are doing a Friday party. Those have higher attendance rates than the weekday ones, due to the park’s local fan base. Make sure your family understands this before you leave for the party. This will reduce disappointment and make for a more relaxed event. After all, you spent all this money to have fun! Storm Troopers, Jack & Sally, Phineas & Ferb, Mickey & Minnie, Duffy, and a host of Villains. Characters are out in abundance at the party and unfortunately, we found that many of these had almost as long of queue lines as the rides, so we bypassed most of them. PLANNING TIP: If getting a photo with one of the more popular party characters is important to you, plan it into your visit and do it early, while others are hunting for food or doing the rides. If you don’t mind a more “random” selection of characters, try a slightly more fun option – the Live Entertainment Spots. The two Live Entertainment Spots on this year’s map are also known as Halloween Dance Parties. These gems are really the surprise hits at this event! This year, the venues hosting them were the Tomorrowland Terrace and Rancho del Zocalo, in Frontierland. We spent a fair amount of time at Buzz Lightyear’s Intergalactic Space Jam at the Tomorrowland Terrace. 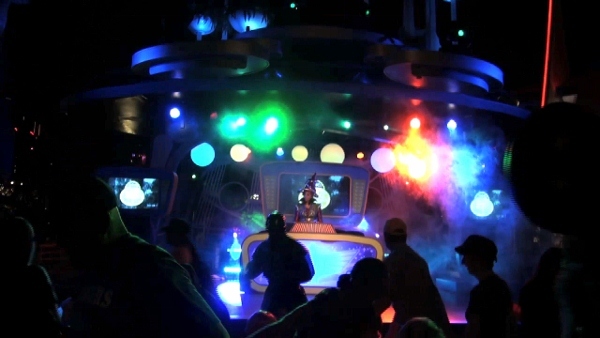 While we never saw Buzz, we were hosted by an alien DJ and did get a chance to dance with some of Star Command’s finest ladies and several of the Green Army Men. Let me tell you, Sarge has taught his soldiers how to cut a rug! Due to the size of the venue, there was a lot of space for everyone to participate. Goofy, Donald and Chip & Dale were on hand, along with quite the handful of pirates, to host the Piratepalooza at Rancho del Zocalo. This was definitely the more “themed” of the dance parties. 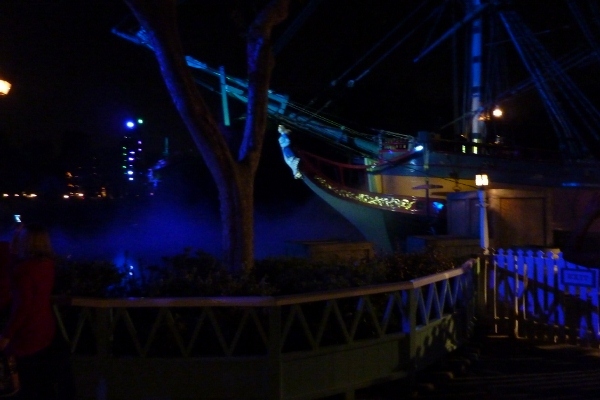 While Buzz’s used the existing futuristic stage, Disney went all out in giving the Rancho a bit of “pirate style”. Take that, add the benefit of dancing with the most famous of the Disney friends in their pirate best, and you have a definite recipe for party success! It wasn’t as large as the Tomorrowland dance party, but definitely worth a visit. As I mentioned before, we split up to do the cavalcade at different times. My family chose the 8:30 one, while Tom and Tony saw the 10:30 one. 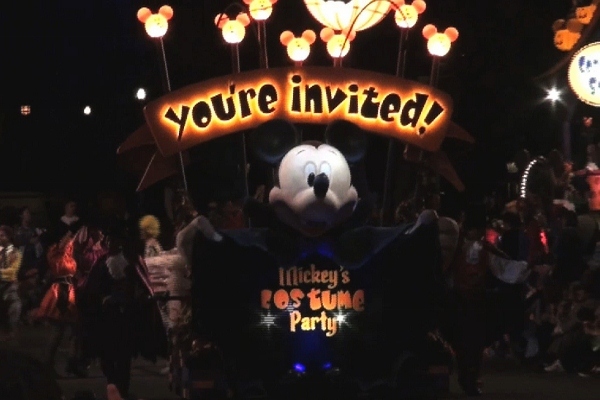 Keep in mind that this is not a full scale parade, hence the name, but it was a nice treat With catchy music, fun characters, and even a “Guest Family” being chauffeured down the route, we all thought Mickey’s Costume Party was definitely a treat! 8:30 PLANNING/DINING TIP: It’s very easy to find a seat on Main Street U.S.A. for this parade time. Most guests are distributed throughout the park and Main Street is fairly empty. However, if you are wanting to snag a prime viewing spot immediately in front of the castle for the fireworks at 9:30, try to sit in the hub. We chose Main Street – right by the Blue Ribbon Bakery. That way, we were able to grab lattes and some of those amazing demitasse treats and have a snack while waiting. 10:30 PLANNING/DINING TIP: Since this parade is after the “post-fireworks mass exodus”, seating is easy to find throughout the park. If you want a Main Street spot, just let the initial wave of exiting guests pass and then claim a spot. Snacking while waiting is always recommended! One of the biggest surprises of the night came from the cavalcade. As Mickey’s float passed, ending the parade, we were treated to a Halloween greeting from none other than Miss Piggy herself, dressed as a saloon girl! If there was anything that truly celebrated the union between Disney and the Muppets, this was definitely it! (Not to mention, this was a complete promotional tie-in with the new Muppet movie coming out this holiday season – but you knew that already…. Disney synergy in action!) It was definitely a highlight for me! This brings me to our final topic – the pièce de résistance – the Halloween Screams fireworks. Everyone wants the best place to see this show and I think you won’t be surprised when I tell you that directly in front of the castle is best. 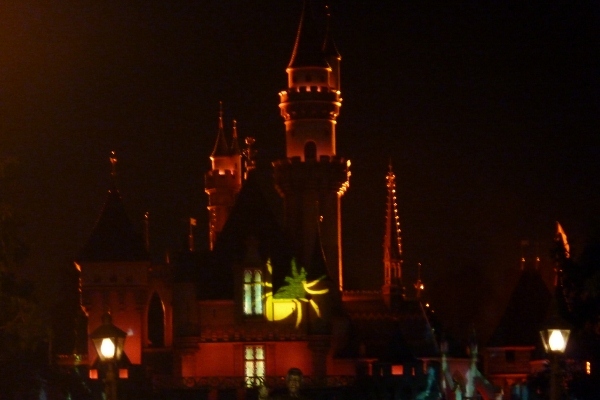 For this show, the projections on the castle are the icing on the cake. If you can’t see them, then you lose a bit of it. You already read the tip about getting a spot immediately after watching the cavalcade in the hub, but I have a couple more comments to make. PLANNING/DINING TIP: If the 8:30 cavalcade isn’t your thing, time your arrival into the hub right around 8:40-8:45 , around the time the final float is passing by. That way you can walk right up to the front of the castle and claim a spot. Bring snacks with you, so you can make the most of your time, or send someone to the Plaza or Coke Corner to grab something. Don’t let them wander too far to get food, or they won’t be able to get back to you before the hub fills up. PLANNING TIP: If you aren’t front and center, choose the Tomorrowland side of the hub. The trees on the Frontierland side block the view of Jack’s crystal ball, as seen in the photo, below. Keep in mind that no one is allowed to claim a spot in the hub center, around the Partners statue. It is used for an emergency walking route. We actually grabbed our spot immediately behind the rope on the Tomorrowland side of that walking path and it was a perfect view, as you could see from the shots in our video, above. Jack introduces us to all of the other Disney Villans that are waiting in the wings. 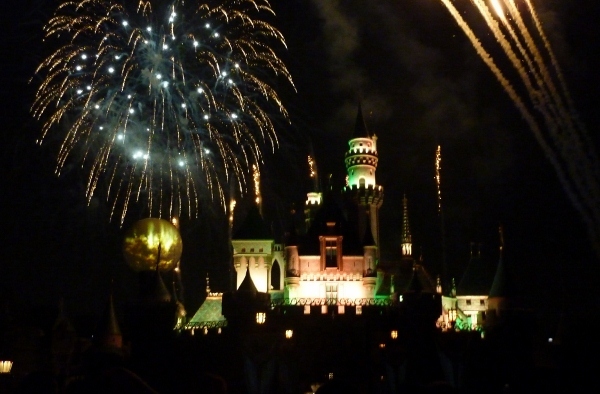 This is possible the most extensive (and many say the best) fireworks show that Disneyland has. After the fireworks, there is still plenty of fun to be had until 11:00 pm on weekdays and midnight on Fridays and Halloween night. Ride lines tend to diminish and there is still plenty of treats to be “tricked”. 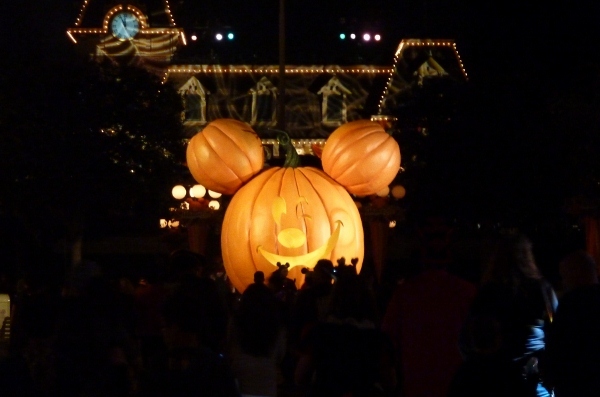 However, when your witching hour comes and you leave the parks, you’ll notice that the jovial Mickey Pumpkin in Town Square winks at you, playfully. Does he know you’ll be back next year? It’s for your family alone to decide if you will become another HappyHaunt in Mickey’s Halloween Party experience! 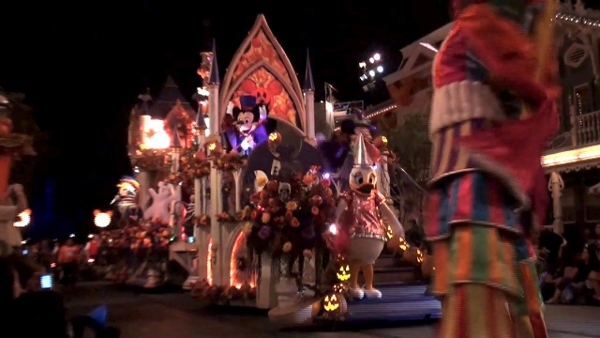 Click here to listen to our October 6th discussion of 2011′s Mickey’s Halloween Party at Disneyland! Photos by N. Johnson, I. Johnson, and T. Bell.